Hey folks welcome to another edition of our theme roundup. Hope you all are enjoying the pre-release BlackBerry 10 OS images! I know I can't wait to get my hands on a BB 10 device. My one burning question though is will it have themes? I certainly hope so don't you? If you developed a theme you want to share or see featured in the contest or discovered a really great one out there by all means shoot it on over to us! Submit your tips and suggestions to themeroundup[at]crackberry.com for consideration. While there's no contest this week, I hope you enjoy this week's picks so be sure to click on the jump to check them out. 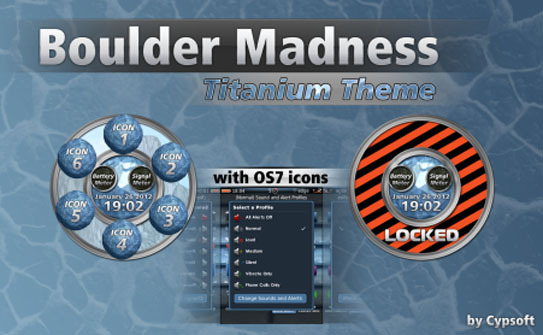 Boulder Madness by Cypsoft is a truly unique theme for BlackBerry. Based on their game of the same name, its interface provides a clean and smooth look and features a main screen panel that holds your top six apps. Available in five materials or colors, Rock, Granite, Silver, Gold, and Titanium (as seen above), it's definitely one you don't want to pass up. 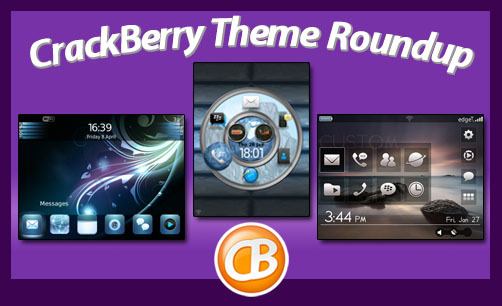 Each theme is available for $2.99 in BlackBerry world and is only compatible with OS 5 and OS 6 devices (8900/10/80, 9000, 9100/05, 9300/30, 9500/20/30/50, 9630/50/70, 9700/80/88, and 9800). (This theme is not compatible with OS 7 devices). There are no words to describe the breathtaking beauty of Lucid by Mobster Mobile Design. It's an elegant and simple user-friendly theme that will look great with any of your favorite wallpapers and images. Lucid features four fixed icon categories (settings, media, social, and custom) and eight to ten custom icons that can be used to display your favorite or most used apps on the home screen. It is compatible with BlackBerry 8350, 8520/30, 8900/10/80, 9000, 9100/05, 9300/30, 9500/20/30/50, 9630/50/70, 9700/80/88, and 9800. You can grab this amazing theme from BlackBerry App World for $.99. 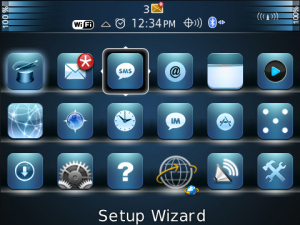 (Please note this theme is not yet compatible with OS 7 but MMD says it will soon be available for all OS 7 devices). Awesome Design Theme by Intellect Dimensions lives up to its name. It is a lovely and colorful theme that I personally can't stop looking at although I'm a little biased as blue is my favorite color. Featuring gorgeous high quality backgrounds and a customized icon set and signal meters it's the perfect theme to liven up your BlackBerry. If you find this as attractive and beautiful as I do, then head on over to BlackBerry App World and download this today for $1.99. It's compatible with BlackBerry 8520/30, 8900, 9000, 9100/05, 9300/30, 9500/20/30/50, 9630/50/70, 9700/80/88, 9800, and 9900/30. Paper Art Theme by Pixel Dreems is an adorable work of art that is sure to brighten up your day. 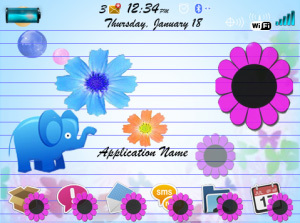 With its cute pink flowery icons and colors, wildlife and paper backgrounds, and its customized fonts and dialogue boxes its sure to bring a smile to you face every time you pick up your device. Paper Art is compatible with BlackBerry 8350, 8520/30, 8910/80, 9000, 9500/20/30/50, 9650, 9700, and 9800 and is $3.99 in BlackBerry App World. (This theme is not compatible with OS 7 devices). Fantastic Desktop by SIK Technologies Pvt. Ltd.
For those of us facing the harshness of winter, Fantastic Desktop by SIK Technologies, is a refreshing theme to remind you that summer will soon be here. 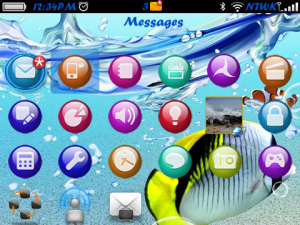 It's an eye popping theme with high quality wallpapers, icons, and colors and customized buttons and tabs. Fantastic Desktop will certainly give your device a different look so why not grab it today at BlackBerry App World for FREE! It's available for BlackBerry 8350, 8520/30, 8900/10/80, 9000, 9100/05, 9300/30, 9630/50/70, 9700/80, and 9800. 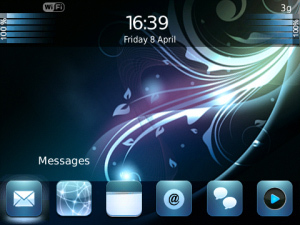 (This theme is not compatible with OS 7 devices).